They said it couldn't be done, but geeky sophomore Lauren Carlson transformed herself into a popular girl after moving to a new school half-way across the country. Amazing what losing your braces and going out for cheerleading will do. Only trouble is, the popular crowd is wearing on Lauren's nerves and she can't wait to return to summer camp where she's valued for her brain instead of her handsprings. She misses her old friends and most of all, her long time camp-only boyfriend, Seth. This year she intends to upgrade their relationship to year-round status once she's broken up with her new, jock boyfriend, Matt. He doesn't begin to know the real her, a girl fascinated by the night sky who dreams of discovering new planets and galaxies. But Matt isn't giving her up without a fight. As he makes his case to stay together, Lauren begins to realize his feelings run deeper than she ever would have guessed. What if the guy she thought she was meant to be with forever isnt really The One? Returning to Camp Juniper Point was supposed to ground her uprooted life, but she's more adrift than ever. Everything feels different and soon Lauren's friends are turning on her and both guys question what she really wants. As summer tensions escalate, Lauren wonders if shes changed more than she thought. Will her first big discovery be herself? I Wish I Could Go To Summer Camp! This was such a fun book to read! It made me laugh, it made me cry and it made wish I wasn't too old (and married) to go to summer camp! Camp isn't a total loss though, because it's during this time that Lauren finally discovers who she is which is something no boy can give you, regardless of how smart he is or how great he looks without a shirt on. Lauren also learns that people have a way of surprising you and while life is full of tough and unpleasant things, how a person handles those situations is a sign of their true character. This really is a great read and I loved the characters, the witty writing and how J.K. Rock made Lauren the true hero of this story. They also made me cry (in a good way) because I came into CAMP BOYFRIEND rooting for one boy, fell in love with the other one and ended up waving my giant foam finger for Lauren! Read it! It was fun. It was silly. It was serious. What a good book for young girls trying to find themselves. Girls need to understand they don't have to have a boyfriend to discover who they are. I'd recommend Camp Boyfriend to anyone, even if they aren't so young anymore. That being said, this book still had plenty of fun stuff involved! I loved Gollum with his whistle and Emily with her strong, loyal, energetic personality. Lauren was very easy to relate to. I loved that she fit in with more than one crowd because that's how I felt in high school, and not everyone seemed to appreciate it. It was hard for me to figure that part of me out too. Finally, the guys. This one was tough for me. I had already fallen for Seth in Camp Kiss, so when I started Camp Boyfriend I wasn't impressed with Matt, but I suspect that was what JK Rock had planned all along. As the book progressed I slowly began realizing how amazing both guys were. By the end, I was team Matt all the way! He was gorgeous, athletic, popular, charismatic, troubled, musical, loyal, caring, passionate, and strong. I can't wait to see what's next!! I will definitely be reading the rest of this series! The teen years can be some of the most confusing and drama filled years of a person’s life. Perfect for an author to create wonderful stories but tricky to pull off in a realistic and enjoyable style. J.K. Rock, to put it in easiest terms, rocks it. Lauren Carlson cannot wait to go to her favorite summer camp, Camp Juniper Point, when her story begins. A lot has changed since last summer. She has moved across country, has a new look, became a cheerleader and is now part of the “in crowd.” Her new found popularity is tiresome and she really wants to recapture the way it was before all the changes. The biggest thing she wants is to tell Seth her “camp boyfriend” that she wants them to be a couple, full-time. No more breaking up at the end of summer for her! She is positive Seth is perfect for her. He understands the real Lauren unlike her school boyfriend, star quarterback, Matt. Lauren works up the courage to break up with Matt at the end of the school year only things don’t go as planned. Yikes! His parents surprise him with horrible news and he wants to go to camp with her to escape all the drama! How can she crush him when he’s dealing with a major family crisis? He needs her to be there for him. She understands how hard family drama can hit you since she is dealing with some of her own with her sister’s upcoming wedding and a father who is always working rather than being the dad she used to count on. Now what is she going to do? Hopefully, she’ll be able to explain everything to Seth before he finds out she has brought a boyfriend with her. Will he be cool about waiting for her until she finds the perfect time to break up with Matt? Lauren hopes so! Camp starts all wrong. Her friends aren’t sure about her new look or the fact that she is a cheerleader now. Seth is hurt and confusing things even more by showing interest in another camper but still kissing her. Matt refuses to give up on them once she finally tries to break things off and his kisses confuse her even more. The mean camp girls cause major issues between Lauren and her friends with their not-so-funny pranks. It just isn’t the summer she wished for. Will she ever be able to decide which boy is best for her? J.K. Rock had her hands full with this one. Lauren’s life has some pretty major changes and her makeover changed how people see her. A situation that is never easy, no matter what age. Camp Boyfriend quickly became a story of self discovery more than anything else. Her characters are likable even the mean girls. Well, most of them anyways. The situation is believable. She keeps the reader turning pages with perfect pacing. She’ll make you laugh. She keeps you guessing right up until the end which boy Lauren will pick. But most of all, Ms. Rock gives her readers hours of reading pleasure with her drama-filled teen romance. I have been anticipating Camp Boyfriend for such a long time, it seems. When I finally received a copy, I squealed with delight and immediately began reading. Boy, oh boy, it was so worth the wait! 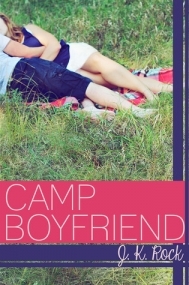 Camp Boyfriend is the epitome of what a Young Adult Contemporary story should be. It was full of love, self-discovery, roller coaster emotions, humor, decisions, family issues, friendships, and more. The main focus of this story was Lauren making Seth her boyfriend: not just her camp boyfriend, but her permanent boyfriend. The problem with that was that she was dating a boy, Matt, from her new school in Texas. While trying to break up with Matt, he revealed a family issue going on with his family and said he would be going to Camp Juniper Point with her. To North Carolina. For four weeks. Womp, womp, woommmpp! Once they got to camp, and the secret of Seth "the camp boyfriend" and Matt "the home boyfriend" came out, it was straight-up trouble for Lauren. The path of figuring out what and who she wanted was greatly detailed and a hard decision to make. The emotions were so real. I felt for her. I cried for her. I admired Matt's character to let her have her space and figure out what she wanted. He was definitely not giving up easily. Lauren also had issues with her friends at camp. Her Munchies cabin friends didn't really care for the new Lauren: her new look, the way she dressed, the jock boyfriend that Matt was... They eventually exiled her and she had nowhere to go but to the Divas' Den. If you read Camp Kiss (you can download it for free http://www.spencerhillcontemporary.com/Camp_Kiss.html, if not! ), you'll know that these two cabins are enemies! Everything they do is a competition and they're so snarky and so typically teenager-y mean to each other, especially the Divas. The ending of the book and how it all wrapped up was fantastic! It was exactly what I had hoped for. I loved Lauren and the growth she showed. She never gave up on her friends, Matt, or Seth. She had to figure out what it was that she needed and what was best for her. Her decision was brilliant! I wholeheartedly approve! Joanne and Karen wrote a great cast of characters. From the mean girls, the nerdy girls, the geeky guys, the jocks, the counselors...all of them! They were easily distinguishable and likeable; even the mean girls...eventually. I can't wait to read the next two books in the Camp Boyfriend series: Camp Payback and Camp Forget-Me-Not. I am very anxious for the summaries of these books! Ahhhh! I thoroughly enjoyed it and it was almost perfection to me. I am so glad these two ladies are writing together...and writing more! Camp Boyfriend is definitely a book to purchase and share with all of your friends. It will be a true delight for lovers of YA Contemporary.